On Saturday 23 October the four-year-old Brussels Bronte Group proved that nothing can stop it from offering outstanding literary events. 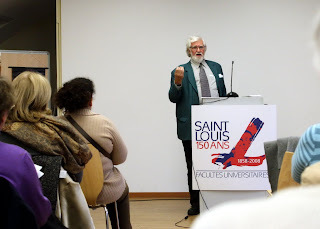 Speakers from London and Paris struggled through strikes on the Eurostar and on pretty much everything in France, around 100 audience members braved miserable Belgian weather, and the British Ambassador arrived at the lecture hall on crutches. 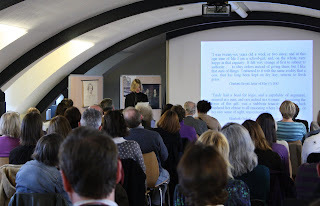 The Group's founder Helen MacEwan opened the talks by welcoming François Fierens, a direct descendant of Charlotte’s beloved professor Constantin Heger. Monsieur Heger spotted the merit of the sisters’ work quickly enough to save many of their essays and his great-great-great-grandson was able to bring four of these with him to the Group event. Helen then gave the floor to Jonathan Brenton, the new British Ambassador to Belgium. A Uganda-born Doctor of English literature, Mr Brenton said culture, literature and immigration were as important to building relations between countries as anything on the EU policy agenda. He had therefore been immensely pleased to learn of the existence of a group set up in honour of two women whose work was enriched by their time outside the UK. The next speaker returned to the topic raised by the presence of François Fierens. Sue Lonoff, editor of Charlotte and Emily Brontë: The Belgian Essays, gave a talk on Two Contrasting Brussels Experiences. There are obvious differences between the two women’s experiences in Brussels, said Ms Lonoff. Charlotte was intrigued by the city, fell in love and after a brief return to Haworth came back to Brussels as a teacher at the Pensionnat Heger. Back in England, she based the plot for two of her four novels on events in Brussels, whilst elements of the other two were apparently inspired by her time in the city. Emily on the other hand left as soon as she had chance and never seems to refer to time spent away from Yorkshire in her work. 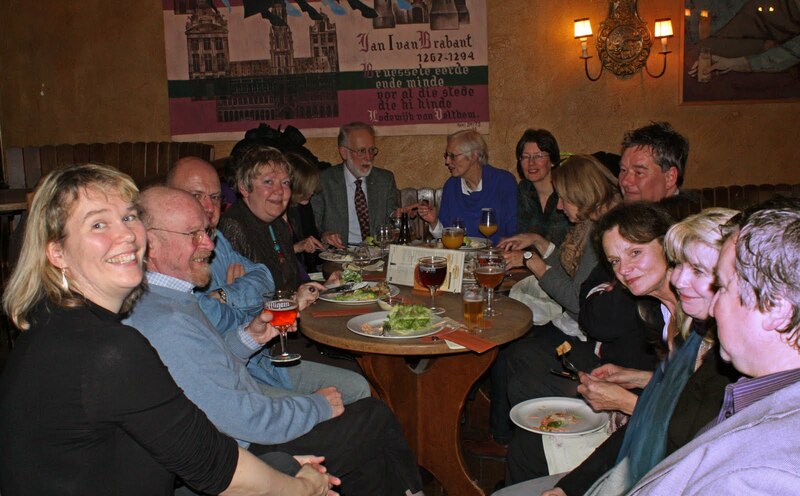 Sue Lonoff argued that essays written by the two authors whilst pupils at the Pensionnat provide a less obvious illustration of their different attitudes and experiences in Brussels. This is particularly true, she said, of the five ‘twin’ essays, given at the same time and on the same subject. In the twin essays Caterpillar (Charlotte) and Butterfly (Emily) it seems M. Heger has asked the sisters to write about an insect’s metamorphosis and to draw a moral lesson from their description. For Charlotte the caterpillar is like man, he eats and crawls through a miserable existence, the chrysalis is the tomb, and the butterfly resurrection. Charlotte’s French is good but the parable conventional. Emily meanwhile rages imperfectly but unnervingly that “All creation is equally mad” [La création entière est également insensée],before squashing the caterpillar she finds eating a plant. A last-minute butterfly flies past to make her wonder if there might be something other than her dark thoughts, but the reader is left with her impression that “Every being must be the tireless instrument of death to others, or itself must cease to live”. Brian Wilks, a former vice-president of the Brontë Society, also turned to a less widely studied aspect of the Bronte’s lives: their father’s youth in Ireland. Mr Wilks is the author of The Brontës of Haworth and biographical works on Jane Austen, amongst others. He said the idea that the years before Patrick Bronte went to Cambridge aged 25 were irrelevant to the Bronte’s development was a serious error. Patrick was 12 at the time of the French Revolution, 13 when the Rights of Man was published and 21 during the bloody 1798 Rebellion. As well as witnessing the brutality for which the Rebellion has become infamous, the fact that Patrick’s brother was a United Irishman will have made life extremely dangerous for the whole family. Small wonder then, said Brian Wilks, that Patrick always defended the underdog in his position as clergyman, or that he took advantage of the freedom of the press in his adopted land to write copiously, or that violence and rebellion are always a theme in the novels of the three sisters. The father’s history was the background to the daughters’ lives. One reason why this weekend was such a special occasion was that Group members finally got to meet M. François Fierens, a direct descendant of Constantin Heger. This is his first contact with our group but not with the Brontë Society. 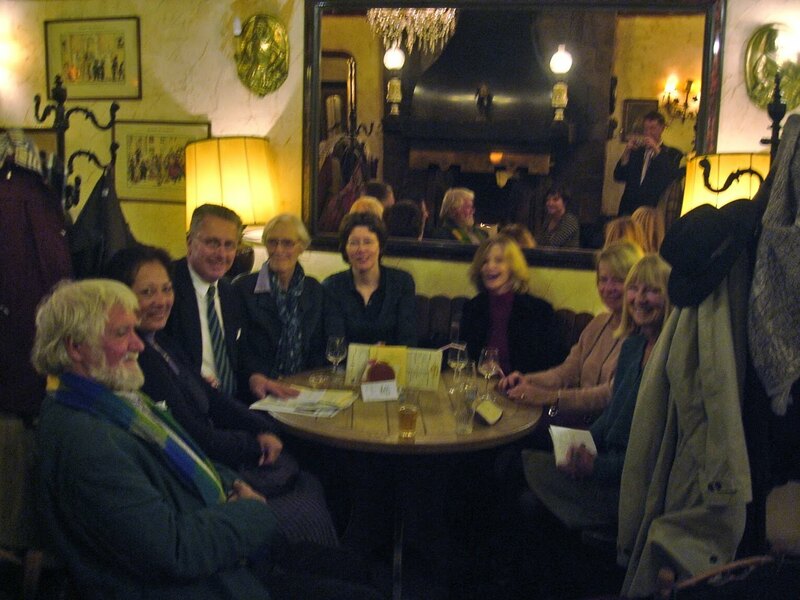 He met members when they visited Brussels in 1993 and again in 2003. He is a member of the Society himself, though he has never been to Haworth – something for him, and us, to think about for the future? 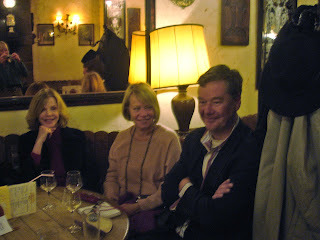 On the eve of the talks, I and other Brontë Society members had dinner with M. and Mme Fierens, Brian and Sue Wilks and Sue Lonoff, who had last met M. Fierens almost 20 years ago when working on her edition of the “Belgian Essays” and had pleasant memories of his hospitality to her when she spent a couple of days in his house copying the devoirs still in the possession of the Heger family. He told us that when he used to stay with his grandparents as a boy he would sleep in a room his grandfather had made into a “family temple”, full of photos and other mementos of Constantin and Paul Heger, so he grew up knowing about Constantin and the Brontës – who are viewed by the family as a fairly minor episode in Constantin’s long and full life! The account in the Brontë Society Transactions of the unveiling of the BS plaque in Brussels in 1980 mentions that members were invited to lunch afterwards at the house of his grandparents, M. and Mme Pechère. In Coreen Turner’s account of the 2003 Brontë Society excursion to Brussels, she says: “Sadly, we did not know beforehand that M. Fierens wore a watch and chain, or one of us would surely have worked a watch guard for him…” I asked him to confirm whether, like M. Paul, he does indeed wear a watch and chain. He promptly produced one from his waistcoat pocket and explained that he took to wearing it when his wristwatch was snatched by a pickpocket in South America! The next morning, as Emily has related, he came to hear Sue Lonoff give her talk on the Belgian Essays and this time produced something still more remarkable: the (bound) manuscripts of the four devoirs in his possession! A magical and memorable moment for those of us who were there to witness it. Many members have said how much they enjoyed the day of talks on 23 October and I think it will go down in our annals as a special occasion. In fact what was to be a day-long event turned into a weekend, starting with a dinner for some of us on Friday to meet the Heger descendant François Fierens and finishing on Sunday with a mystery tour of lesser-known Brontë places by Eric Ruijssenaars (I won’t go into details - if I do it won’t be a mystery tour next time!). What a privilege it was to have two scholars of the calibre of Sue Lonoff and Brian Wilks with us on the same day. Few people know more about Charlotte and Emily Brontë’s stay in Brussels than Sue Lonoff, who translated and edited their devoirs. As for Brian Wilks, his enthusiasm on a wide range of topics makes him fascinating company, but one theme he always returns to is the origin of the Brontë family’s genius (for which one of his favourite images is “the Crucible”). Hence his interest in Patrick Brontë’s Irish origins. Before he gave this talk someone asked him “Who on earth is interested in a talk on Emily Brontë’s dad?” The reason is obvious both to him and us: because we are fascinated by the mystery of where the Brontë children’s genius came from. No-one can fully explain genius, but knowing something about where their father came from must throw some light on the family as a whole. As well as the usual multinational gathering of the members who live in Brussels, with just about every European country represented (many Irish members this time, drawn by the talk on Patrick Brontë) we were joined by members travelling from the Netherlands and, for the first time, from Luxembourg, as well as by stalwarts Mirka and Jiri, joining us once again from Prague. In addition to having two such excellent speakers in our midst, with opportunities over the weekend to meet them socially, the talks were made special by the presence of François Fierens and the British ambassador, Jonathan Brenton. And apart from all these riches, the talks, like all our events, gave members a further opportunity to get to know more of their fellow members. In his introductory talk, Jonathan Brenton spoke of the role of literature in bringing people together, and this is surely the most important function of a literary association like ours. Reading is necessarily something we do alone, albeit in close communion with the author and his creations. But a group like ours brings us together to share this reading experience, and the discussions generated by our aggregate knowledge and insights, combined of course with the knowledge and insights of the speaker, can be truly exciting and rewarding. 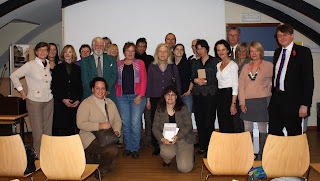 This is a translation of an article by Jolien Janzing originally published in Dutch in the Belgian newspaper De Standaard Der Letteren on 13 August 2010 about a trip to Haworth to research a novel she is writing about the Brontës in Brussels. While there, Jolien met various people in the village including the director of the Brontë Parsonage Museum, the parish priest and a guide who does Brontë walks. Jolien Janzing established her reputation through widely-discussed articles published in Belgian and Dutch magazines. Her first work, Grammatica van een obsessie, received excellent reviews. 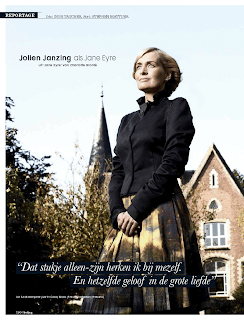 In a recent article in the Belgian magazine Feeling, Jolien identifies with Jane Eyre because she too felt like something of an outsider as a child, being Dutch but growing up in Belgium. She recognizes in herself the belief in true love that Jane Eyre had. And she says that Charlotte Brontë inspired her to become a writer herself. There are some classics which simply never lose their charm. Jane Eyre by Charlotte Brontë, for example, or Wuthering Heights by her sister, Emily, which are still being published in no less than 26 languages. And it’s not just the Brontë sisters’ books which continue to sell like cookbooks; the Brontë Parsonage Museum in their native town of Haworth continues to welcome a steady stream of visitors. If anyone should doubt, the Brontës are still alive and kicking! It’s Monday morning and while the sun is shining in Flanders the barren landscape of the Pennine Hills in West Yorkshire is cold and windy with menacing clouds as wet and oppressive as a bad cough and night sweats. But why am I here actually? In fact I’m working on a novel which looks at the two years Charlotte and Emily Brontë spent in Brussels learning French, So clearly there’s more research to be done back home than here in England, but when I find myself a bit later going up the steep Main Street leading to their father’s parsonage it all becomes clear again. Main Street has hardly changed since Charlotte lived here, even the cobblestones are hundreds of years old, and I can see her walking in front of me, a delicate young woman with a narrow back and slightly hunched shoulders wearing an ill-fitting overcoat. She’s hurrying home, occasionally nodding to a regular churchgoer. I’m somewhat obsessed by the Brontës and want to see where they lived. My diary is full of appointments with people who know about every aspect of the village and every detail of the family’s history. For my part I quickly read everything Charlotte, Emily and Anne ever wrote, from the poems about their imaginary worlds of Angria and Gondal to their best-selling novels originally published under male pseudonyms. It’s not only their books which fascinate me, but also their private lives. The sisters grew up in Haworth, which at the time was an overcrowded, bustling little town, with their father being an Anglican parson at the head of the parish church. The Brontë girls’ mother had died at a young age and an aunt helped raise them. The four oldest girls, Maria, Elizabeth, Charlotte and Emily, were sent away to a new boarding school, the Clergy Daughters' School at Cowan Bridge, but this turned out to be a wretched institution. While there, Maria and Elizabeth contracted a deadly infection and Charlotte endured a number of traumatic experiences which she purged from her system by writing Jane Eyre. Mr Brontë was left with three daughters and a son, Branwell, whom he spoiled horribly and who died at a young age due to a penchant for alcohol and opium. His daughters fared better and became well-known novelists, but they all died prematurely. At the top of Main Street is the Black Bull pub where Branwell went to drink his ale and whiskey. There is a path on the right which leads to the church and directly behind it is the parsonage. I stand in the front garden and look up at the facade, thinking that the parsonage is certainly not what you would call a humble abode. And even if I imagine away the new wing, the house exudes a certain social status. I turn around and between the low garden wall and the church I see part of the cemetery. Here and there I see a standing tombstone, but most of them have been laid flat on the ground as if the living wanted to prevent the dead from crawling out of their graves, just like Cathy. Time has stood still here and the atmosphere is hazy and somewhat ominous. It takes a bit of time before I can actually go into the parsonage because there are quite a few visitors there today: Scottish teenagers, Italian students, a bunch of Japanese and a group of Americans. At the threshold I stop for a moment and think about how many times Charlotte walked over it and that this is where Emily whistled to her dog, Keeper. I had expected to feel a lump in my throat when getting so close to the Brontës, but that didn’t happen after all. From Mr Brontë's study I walk to the dining room with the table where the sisters sat when writing their novels. Andrew McCarthy, the museum’s director, is waiting for me in the kitchen and invites me into his office. There, I ask him if there are always so many visitors. “Oh yes!” he proudly answers. “Last year we had 73,000 people come to the museum. Our visitors come from Japan, the US and Europe, and of course also from England.” I ask him if he sees more visitors when a television network airs a series based on the Brontës or their books. Outside I open my umbrella and walk towards the church, but on my way there I stop for a moment at the low building where Patrick Brontë taught Sunday school. Through the dirty windows I see quite a few spider webs, but some desks for the pupils are still there. Charlotte Brontë taught catechism here when she was only 16. Emily didn’t like teaching, because she didn’t really like children. When she worked as a teacher for a few months at a girl’s boarding school when she was twenty, she told her pupils that she cared more about the dog than any one of them. She was a bit strange, that Emily, and possibly slightly autistic. Someone taps me on the shoulder and for a split second I feel like a character in a novel when something dramatic is about to take place. Unfortunately, there is no seductive Mr Rochester standing in front of me but instead a sprightly vicar. His name is Peter Mayo-Smith and we have an appointment. He takes my arm and leads me into his church. Once upon a time, Patrick Brontë stood here at the pulpit and through his inspired sermons brought together his community. Peter’s eyes are sparkling and it’s easy to see that Brontë is his role model. He springs up and at the front of the church shows me the family grave where Maria Brontë, her children Maria, Elizabeth, Branwell, Emily and Charlotte, and also Patrick Brontë, were laid to rest. Anne is buried in the coastal town of Scarborough where she was staying while trying to recover from tuberculosis. Behind me I hear a repressed sob and see a blonde woman in her forties crying. Her daughter puts her arm around her shoulders. We start talking and she tells me “Charlotte, Emily and Anne weren’t beautiful or glamorous, they weren’t models or actresses. No, no, they were ordinary women just like my daughter and I, but we also have a right to be loved.” I suddenly feel a need for fresh air and quickly say goodbye. Johnnie Briggs, my new guide, is waiting for me at the church portal. He takes me to the cemetery in the pouring rain and tells me about the high rates of child mortality during the 19th century. He has an umbrella with him, but he doesn’t open it. There’s a drop of rain hanging from his nose and his coat is completely soaked, but this doesn’t seem to bother him. Mary is from London and lived several years in Amsterdam, but Haworth and its stories have captured her heart. She lives together with her husband and two daughters in an isolated cottage somewhere in the hills, and this makes her a bona-fide Brontaholic. The following day the rainclouds have given way to a more sympathetic blue sky. Emily was in the habit of taking walks on the moor in the rain and during storms, but I’ve decided to wait for more clement weather. Johnnie recommends that I go to the waterfalls, which was a regular walk for the Brontës. I don’t bring a dog along with me, but I can imagine how Emily’s dog, Keeper, a tough bulldog, must have chased the sheep around. Since last Sunday we have a new Brontë walk guide, as Jones Hayden has volunteered to lead some of our walks. For some time now they have been led by Myriam Campinaire who’s been doing it brilliantly. In the past, walks have also been led by Eric Ruijssenaars and Derek Blyth, and it is to them we owe a lot of the research and material we draw on. The sun shone and everyone looked happy for Jones's debut guiding on Sunday 10 October. We gathered at 10 a.m. on 10/10/10; it must have been an auspicious moment, for conditions were particularly favourable for that morning’s walk. Not only did the sun shine, but the guide didn’t have to contend with the usual noise of trams and buses on the cobbles of Place Royale, since it was closed for traffic for the Brussels marathon! Jones, an American journalist who’s lived in Brussels for 10 years, enjoyed preparing his walk commentary and, like our first volunteer guide Myriam, has increased his knowledge about the history of the city - as well as about the Brontës - in the process. Although the area covered by the walk is a compact one focusing on places near the site of the Pensionnat Heger, there is no shortage of things to be said about the area and its buildings, the Pensionnat and the Hegers, the Brontë sisters’ stay there, the Brontës in general, Villette, The Professor… the difficulty is packing it all into two hours. As always, a multinational group had gathered to listen. 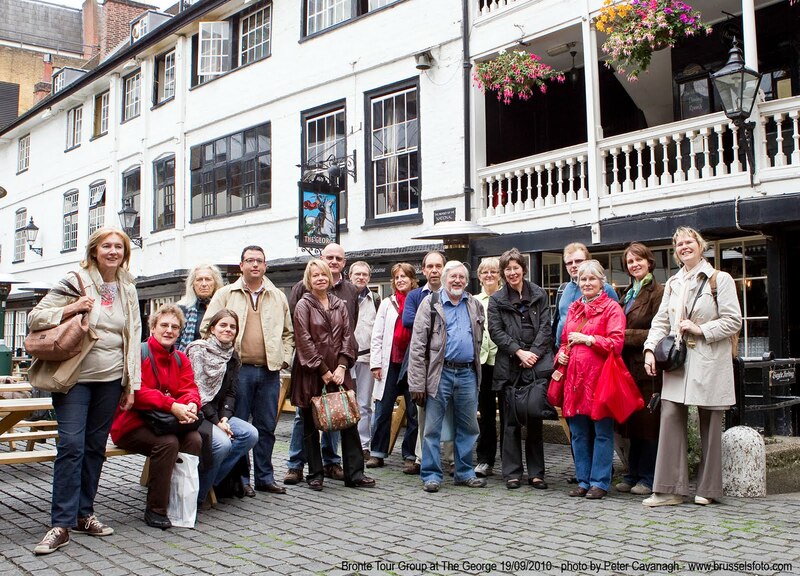 Today our 19 participants were Belgian, British (two from Yorkshire! ), Irish, American, Polish, Bulgarian, Russian and French. After the walk we adjourned, as usual, to one of the museum cafés on Place Royale to continue talking about the Brontës and much else beside. We’re lucky to have two such able and enthusiastic guides as Myriam and Jones. Each has developed his/her own version of the basic walk commentary, so with Jones there was new information to glean for those who had been on a previous walk. This was the last walk of 2010. We’ll start up again once warmer days return, probably not until our April weekend (1-3 April). Join Myriam or Jones next year to learn about the Brontës and Brussels! This was a first for the Group. 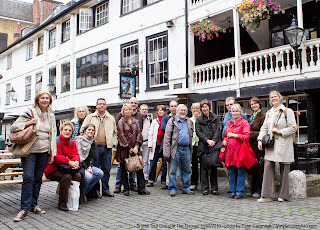 We’ve had weekends of events in Brussels, and groups of us have attended the Haworth weekend, but this was the first weekend excursion organised by us. There were 23 of us in the group. The first day of our Literary Weekend in London was dedicated to the Brontës, and the second to Dickens’s London, Dickens being the obvious writer to explore for a group of 19th century literature enthusiasts on a trip to London. Most of us travelled on the Eurostar arriving around 9 a.m. on Saturday. At 11 a.m. we had a rendezvous with Tim Moreton, Collections Manager in the National Portrait Gallery, who took us to Branwell Brontë’s “Pillar Portrait” of his three sisters and talked to us about it for an hour. He also showed us something we weren't expecting to see (see reports below!) We went on to lunch with members of the Brontë Society’s London Branch in the Strand Palace Hotel on the site of the spot where Charlotte Brontë and her publisher George Smith, posing as a Mr and Miss Fraser, consulted a phrenologist. Margaret McCarthy then took us on a walk retracing the footsteps of Charlotte and her sisters’ visits to London – Paternoster Square by St Paul’s where they stayed in the Chapter Coffee House, St Stephen Walbrook where Charlotte and Anne worshipped, Cornhill where they went to George Smith’s offices on their visit to introduce themselves to him. By the site of London Bridge Wharf where Charlotte got a waterman to row her to the Ostend packet when returning for her second year in Brussels, Margaret’s husband Jerry told us about the Thames watermen in her time. In the National Portrait Gallery just off Trafalgar Square there is a room devoted to early19th century literary figures. In the midst of large, stylised portraits of Dickens, Tennyson and Browning there are two smaller, more modest portraits of the Bronte sisters and it was here that the Brussels Bronte Society started their weekend trip to London on Saturday 18th of September 2010. Most of the group had journeyed to London early that morning and it was fitting that this was the first stop of the group since it gave us time to reflect and think about the sisters and their tragic life. Tim Moreton, the gallery's collection manager, gave us a very interesting talk on the background of these two portraits: the first known as the Pillar Portrait depicts the three sisters modestly dressed and looking pensively at the artist, while the second is a profile portrait of Emily which was probably part of a larger ensemble piece known as the 'Gun Group Portrait'. The artist of both portraits was their brother Branwell. One can see quite clearly that he was not a professional or particularly gifted artist, particularly when compared with the rest of the professional portraits in the room. Another stark contrast is the condition of the portraits. These portraits were taken to Ireland by Arthur Nicholls, Charlotte's husband, after the death of Patrick Branwell, folded and placed on top of a cupboard in a suitcase. The colours have faded and the crease folds are very evident. After the death of Arthur Nicholls the paintings were sold to the National Portrait Gallery by his widow. Tim Moreton told us that the Gallery had made a conscious decision not to restore these paintings since it is felt that their condition is a part of their story and journey. He also discussed at length the famous 'pillar' which is at the center of the first portrait. One can see clearly that originally another figure (probably male) had been painted in but than painted over. Was this Branwell himself or someone else, one can only speculate. Elizabeth Gaskell describes the 'Pillar Portrait' in great detail in her biography The life of Charlotte Bronte. She writes "I have seen an oil painting of his, done I know not when….It was group of his sisters, life size; three-quarters' length; not much better than sign-painting, as to manipulation; but the likenesses were, I should think, admirable. I could only judge of the fidelity with which the other two were depicted, from the striking resemblance which Charlotte, upholding the great frame of canvas, and consequently standing right behind it, bore to her own representation, though it must have been ten years and more since the portraits were taken. The picture was divided, almost in the middle, by a great pillar. On the side of the column which was lighted by the sun, stood Charlotte, in the womanly dress of that day of jigot sleeves and large collars. On the deeply shadowed side, was Emily, and Anne's gentle face resting on her shoulder. Emily's countenance struck me as full of power; Charlotte's of solicitude; Anne's of tenderness. The two younger seemed hardly to have attained their full growth, though Emily was taller than Charlotte; they had cropped hair, and a more girlish dress. I remember looking on those two sad, earnest, shadowed faces, and wondering whether I could trace the mysterious expression which is said to foretell an early death. I had some fond superstitious hope that the column divided their fates from hers, who stood apart in the canvas, as in life she survived…. They were good likenesses, however badly executed." 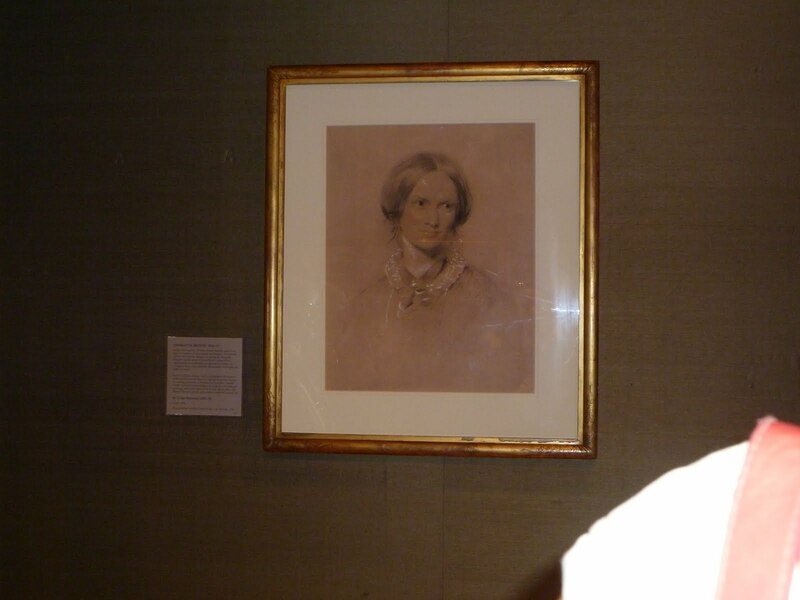 Tim than lead us to an adjoining room where there was a temporary showing of two official portraits of Charlotte Bronte and Elizabeth Gaskell by George Richmond commissioned by their publisher George Smith. This portrait of Charlotte is more stylised and formal, depicting a more worldly woman though still shy and apprehensive. The entire group was mesmerised by the portraits we had seen and the informative talk by Tim. I am sure that the National Portrait Gallery and these portraits have become a 'must revisit' on all future visits to London for the whole group. I will definitely be returning again and again. I have always marvelled at the fact that three sisters born into English provincial obscurity whose combined output of novels and poems would barely fill half a library bookshelf should nonetheless have taken the literary milieu of their day by storm and should to this day continue to fascinate and enrapture readers throughout the English-speaking world – and beyond. To attribute all of that to their 'genius' is a commonplace and a cliché (and in any case, 'genius' is an impossibly elusive, intangible quality which we can at best intuit; trying to pin it down is a futile exercise). My preference would be to describe the Brontë sisters as 'quietly extraordinary': three young women who did quite remarkable things is a most modest, unassuming fashion. 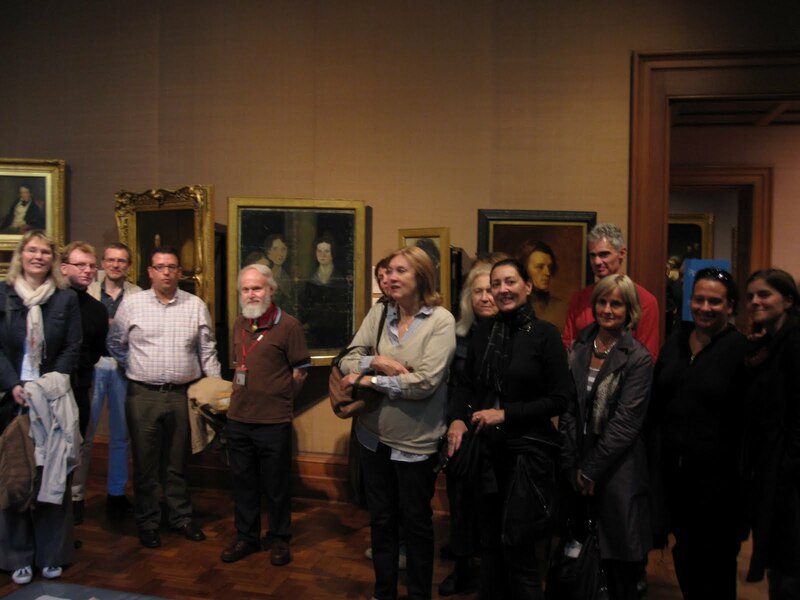 Two aspects of their 'extraordinariness' became apparent to me in the course of the Brussels Brontë Group's recent weekend visit to London (which was, incidentally, my first contact with that group and, indeed, with the Brontë Society as a whole). Our first port of call was the National Portrait Gallery, where we viewed the famous 'Pillar Portrait' in which the three sisters appear seated in the presence of a subsequently blanked-out figure looming over them (presumed to be their brother Branwell, who painted the picture). To be perfectly frank, I find this painting rather amateurish in both conception and execution; the sisters look like Victorian 'young maiden' stereotypes and they are about as distinguishable from one another as are Russian dolls. However, awaiting us in an adjacent room of the gallery was an artwork of a very different calibre: namely, the rarely-displayed chalk portrait of Charlotte Brontë by George Richmond. Even allowing for the artist's alleged tendency to flatter his sitters by 'improving' their looks, I was struck at first sight by Charlotte's extraordinary (that word again) beauty and grace and, above all, by the remarkable sense of her presence and her strength of character which the portrait exudes. Whereas the sisters in the 'Pillar Portrait' resemble cardboard cut-outs, the solo portrait of Charlotte radiates the humanity of its subject; it is truly 'lovely', in the literal sense of the word ('inspiring love', 'worthy of being loved'). Charlotte's strength of character was brought home to me again at the very end of our guided tour of 'Brontë London': we were taken to the place on the north bank of the Thames at which Charlotte would have boarded a river boat – the first stage of her journey across the English Channel to Ostend and thence to Brussels. Our guide portrayed a highly atmospheric scene of Charlotte arriving at the water's edge in the cold and dark, negotiating her passage with the boatmen and being conveyed downstream along a sometimes treacherous tidal river, only to be grossly overcharged for the privilege by her unscrupulous ferryman. Not until the latter part of the twentieth century did international travel become straightforward and routine. In the nineteenth century it still constituted an epic undertaking, fraught with hazard and of uncertain outcome. A young woman who was prepared to embark upon such a journey unaccompanied must have been possessed of a character whose strength can only be described as ... extraordinary. Much more could be written about our literary weekend in London – but I shall leave that to other, more competent hands. I shall conclude by thanking Helen MacEwan for going to such extraordinary (I can't get away from that word) lengths to organise such a worthwhile event and for bringing me back into contact with three lasses who could justifiably be described as 'the Pride of Yorkshire'. The second day of our stay was devoted to Dickens, and our reading group had been reading Oliver Twist in preparation for it. At the Dickens House Museum we were met by Anthony Burton of the Dickens Fellowship, who used to be a curator in the Victoria and Albert Museum and is active on the museum committee. 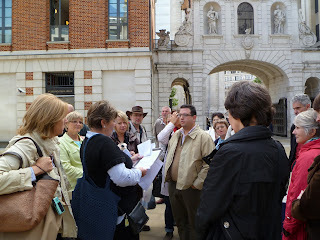 Anthony guided us on a marathon walk that explored the theme of Dickens’s London. We had asked for the walk to start at the Dickens Museum, our first port of call on Sunday, and finish at The George Inn in Southwark, where we wanted to have lunch – the only surviving example in London of the galleried coaching inns common in Dickens’s time. Anthony rose to the challenge and devised a walk to fit our requirements. Leading us at a brisk pace and imparting an impressive amount of information all along the way, he got us to the George at 1.30 pm in time for our roast beef and Yorkshire pudding. His walk took in many aspects of the city Dickens depicted, for example the Inns of Court where some of his characters lived and worked and where he himself was miserable for a time as a solicitor’s clerk. They are all still standing, unlike the Inns of Chancery that were associated with them, only some of which have survived. We did see the striking half-timbered Staple Inn, but the site of Furnival’s Inn where Dickens lived while writing his first novel Pickwick Papers is now occupied by the splendid Victorian neo-Gothic Prudential Assurance Company building. We went in and looked at a bust of Dickens in this building. He would probably not have approved, since his will specifically forbade monuments to him – one of the many pieces of information we gleaned from Anthony’s commentary. In fact it’s a miracle that any of the buildings Dickens knew survived the developers and the Blitz of the second world war. Where the Victorian sites have disappeared, Anthony used old paintings or engravings and readings from the novels to give us the feel of the places Dickens knew: for example the filthy Fleet river, now underground, that used to run under where the Holborn viaduct now rises, through the slum area where Fagin operated. To build up the grim picture Anthony told us of the prisons where rather a lot of Dickens’s characters ended up – Newgate on the site of the Old Bailey, where Fagin was hanged; the Marshalsea, home to Little Dorrit, which stood in Southwark. Why a Dickens Day for a Brontë Society group? Well, why not. Dickens was a contemporary of the Brontës and his London was the one Charlotte visited. She herself was interested in its institutions and visited Newgate as well as the hospital for the insane, Bedlam. In our reading group we explore a range of 19th century writers whose works put those of the Brontës in context. And fostering links with other literary societies whose members share our interest in the 19th century can only be a good thing. I have been to the National Portrait Gallery on many occasions before and knew the portraits of the Brontës to be seen there. I was very excited however at seeing (for the very first time) the original Richmond portrait of Charlotte and Mrs Gaskell. This was a real bonus for our visit to the National Portrait Gallery. And on top of that we had a very passionate guide who could tell us so many interesting facts about the portraits (how they came into the possession of the NPG, how restoration work had been done, etc…). The whole weekend was just great and exciting (both walks, lunches, company, theatre visit including my surprise conversation with Bud, the American calligrapher who happened to sit just next to us in the theatre (life really is full of surprises!!! !, …) but if I have to pick out one particular thing – the Richmond portrait is it! It is now, in the first weeks of autumn, exactly 100 years ago that the Pensionnat building was torn down. A sad anniversary. At the beginning of September the final decision had been made, and published in newspapers. 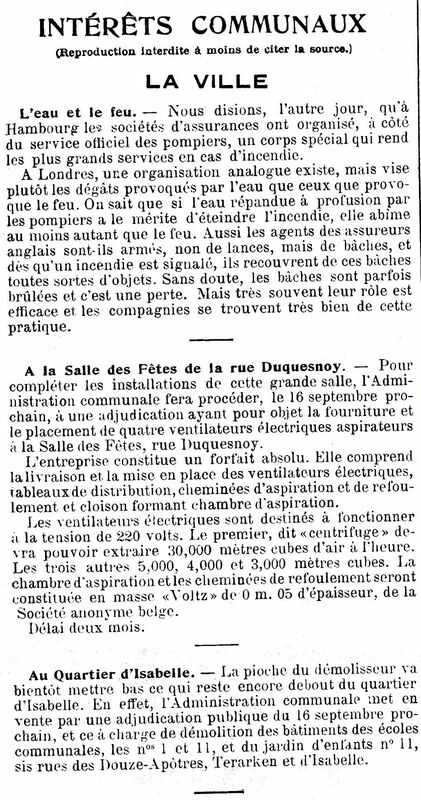 The illustration here is from the Chronique des Travaux Publics (4 September 1910): "The pick-axe of the demolisher will soon bring down what is left of the old Quartier Isabelle". 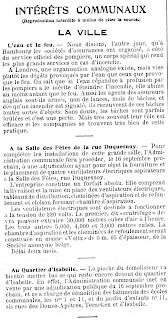 At this time the Pensionnat had become an 'ordinary' school, an 'école communale', as it was named in this note. Much of the quarter had already been torn down in the previous year. It seems likely that this demolition work will have started at the end of September, and will have taken several weeks. It is not entirely clear but it very much seems that by 1 November the Pensionnat was no more. It will never be forgotten though.